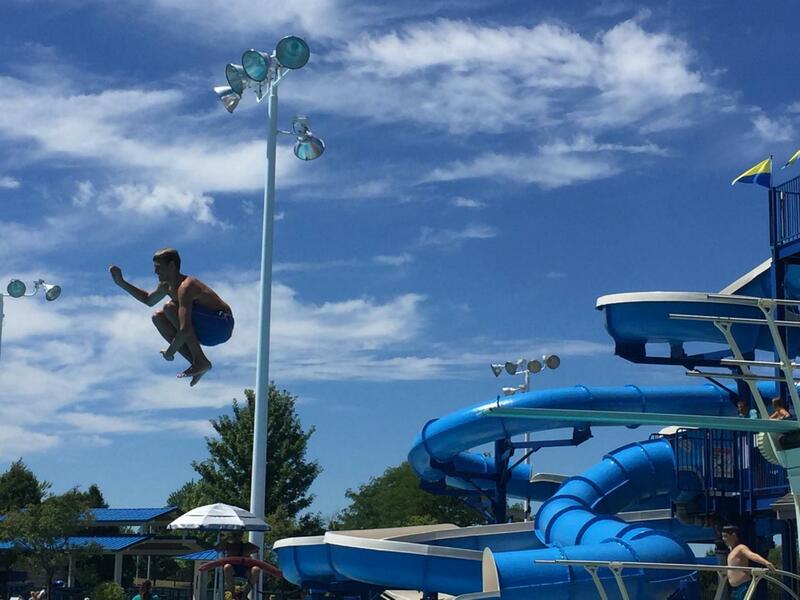 The Beachwood Family Aquatic Center is a summertime favorite of 16-year-old sophomore Bartu Hatipoglu, who is diagnosed with autism. You have probably seen him in the BHS hallways or at the pool holding leaves. positive attitude has been inspirational to many BHS students during the school year and to the staff and patrons of the Aquatic Center over the summer. 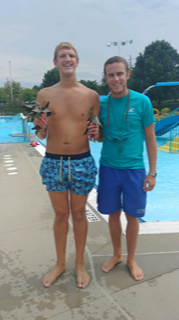 He’s made such an impact that aquatic center manager Missy Bystrom dedicated a day to him, which she called Leaf Party Day. Leaf Party Day took place on Aug. 18. It was a gorgeous sunny day after non-stop rain; the sun was glistening off the pool and a cool breeze was in the air. When staff members arrived, Bystrom greeted them and gave them “Leaf Party Day” t-shirts. Bartu and his family were on their way to the pool. The whole staff waited eagerly at the front entrance. The Hatipoglu family walked in and were overjoyed with excitement. A special song, composed for the event by lifeguard Mark Kovalsky, Jr., played through the sound system. Bartu and his family beamed. Bystrom is a neighbor of the Hatipoglu family. She explained that she and Bartu’s mother, Betul Hatipoglu, became fast friends when they first met. This summer, Bystrom was inspired by her staff to organize the party once she heard about the song that Kovalsky wanted to write. She was also impressed by Bartu’s ability to teach others to appreciate what’s really good in life. “The day itself was unbelievable, and Bartu had no idea what was planned,” Bartu’s mother Betul Hatipoglu said. Bartu was delighted when he saw the staff wearing the shirts and heard the song. “He had genuine happiness,” Betul Hatipoglu said. Bystrom allowed pool patrons—even ones who didn’t know Bartu—to take a spare shirt and join in with leaves of their own. Betul Hatipoglu described the faces [that] the staff and family had when they walked through the front gates of the pool. “It was a priceless that a struggling boy was celebrated,” she said. “When we are so busy in life and we worry so much about the future… Bartu’s very simple joy of life in that moment and at the party, where there were human beings, water, and music around…that gave him the most joyful moment that the rest of us look for in life,” she said. Betul Hatipoglu and Bystrom agreed that Bartu lives in the moment, and in so doing, he is a teacher to them. “He is perfect, and he is teaching us how to be perfect,” Bystrom said. Betul Hatipoglu reflected on a time when they were in Turkey and Bartu pulled strangers off the street to join him in his fun. She and her family are very grateful to the city of Beachwood for welcoming and accepting their son for who he is. This idea of a song for Bartu was brought up in the beginning of summer, and since then the manager and other staff members have thought about planning the Leaf Party. 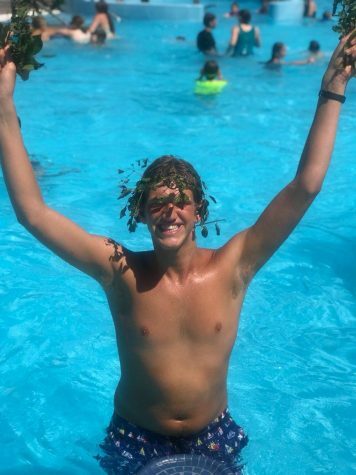 Mark Kovalsky, Jr., a lifeguard at the Aquatic Center for nine consecutive years, wrote the song “Leaf Party” with help from other guards such as Jack Berkowitz and Jack Spero. Kovalsky has been interested in music for most of his life and wanted to do something for Bartu. It all started on a rainy day, a month prior to the party, when Kovalsky and other guards at the pool were discussing the idea of writing a song. “Beach Boys and Chuck Berry,” Kovalsky said. With time and dedication, the song was ready for the party. Kovalsky was happy that he was able to do his part by writing and recording the song to make Bartu and his whole family happy. “[The song was a] way of saying I appreciate you and appreciate you’re here; you make my day better,” Kovalsky said. Kovalsky agreed with the idea that Leaf Party Day should become a tradition at the pool. If you were to hear the song and connect it to Bartu, it is spot on. The song makes you feel happy and giggly the way Bartu is, whether he’s saying “leaf party” or jumping off the diving board, making more than just a big splash in the water. “He’s just genuinely happy,” Kovalsky said. Kovalsky echoes the feeling of many who know Bartu. His enthusiasm for nature has been an example for his mother. “[It] pulls me back to the moment to see what is out there, the small gifts we take for granted,” Betul Hatipoglu said. And the Leaf Party seemed to make Bartu happy too. Even months later in the BHS hallways, the words “Leaf Party” can elicit a wonderful and contagious smile from him.